The Harmattan is a fierce wind that blows across sub-Saharan Africa, stripping vegetation, drying out watering places, and causing health problems for the inhabitants of the Sahel, as the region is known. The dust clouds it creates can block the sun, and have even been strong enough to lift sand particles which are carried by trade winds as far west as Florida. In Jeffrey Tayler’s skilled hands, the Harmattan becomes a metaphor for the insurmountable problems that affect countries across the widest and poorest part of continent. Jeffrey Tayler, who served in the Peace Corps and writes for The Atlantic, traveled from Chad to Senegal, encountering first-hand the ancient traditions and modern troubles that define Africa for many Westerners. Fluent in both Arabic and French, he was able to speak with all types of people without the filter of an interpreter. These encounters turned up both superstition and up-to-the minute awareness of international affairs (many people weren’t shy about criticizing the Iraq War, then two years old), but were for the most part genial and even-handed. One tradition, that of hospitality, has not diminished even in the face of desertification, unrest, and religious extremism. 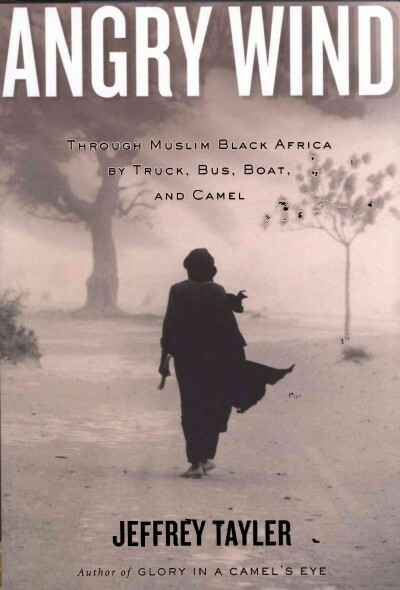 Even ten years after Angry Wind was published it remains a timely read. Boko Haram’s power base is in the Sahel. Niger holds the last spot on the Human Development Index. Mali suffered a revolution co-opted by an al Qaeda offshoot and had to have French assistance to quell it. Chad is overwhelmed by refugees from Darfur, and has a history of coups d’etat that could destabilize the central African region that surrounds it. And history dominates it all – Tayler finished his journey in the House of Slaves on the Atlantic Coast of Senegal, where men, women, and children from the region would have their final views of Africa. Anyone who wants background on this essential region of a continent headed for its own maturity owes it to themselves to read Tayler’s journey. Iranian director Asghar Farhadi brings us a deliciously complex domestic drama. Set in contemporary Iran, A Separation explores the dissolution of a marriage against the backdrop of a mystery. Simin is seeking a divorce from her husband Nader because he refuses to leave Iran with her. Nader also won’t allow Simin to take their daughter Termeh out of the country. Nader wants to stay in Iran to take care of his father who is suffering from Alzheimer’s. A judge refuses to grant the divorce, and Simin immediately packs up and leaves for her mother’s house. Termeh decides to stay with her father Nader. Simin’s absence from the home leaves Nader with no choice but to hire a daily caretaker for his father for the hours when he, Nader, is away at work. Nader hires Razieh, a financially-strapped married woman with a young daughter and a child on the way. Nader comes home from work one day to discover Razieh gone and his father on the bedroom floor, his wrist tied to his bed. Additionally, some money is missing from a drawer, and Nader believes that Razieh has taken it. When Razieh returns to Nader’s home, tensions erupt and a physical encounter results in Razieh accusing Nader of a crime against her. So did he or didn’t he commit the crime Razieh accuses him of? In the ensuing legal drama, the characters struggle with questions of morality, informed by societal dictates of religious and gender roles, and what it means to tell the truth. A Separation prompts us to ask: In desperate circumstances, when our backs are up against the proverbial wall, are we more likely to transgress our moral and ethical boundaries? American viewers unfamiliar with the Iranian justice system will undoubtedly make some interesting comparisons between the American justice system and the Iranian system of justice as depicted in A Separation. Lawyers are non-existent in the film as the accuser, the accused, and witnesses battle it out with each other in front of a judge. Simply put, A Separation is an extraordinary film, one of the best films I have ever seen. The top-rate performances alone make the film worth viewing. Particular stand-outs include Peyman Moadi as Nader; Sareh Bayat as Razieh; and Kimia Hosseini, who steals every scene she is in, as Somayeh, Razieh’s inquisitive, mischievous, and adorable daughter. On the surface Ayaan Hirsi Ali and I have a lot in common: we are very close to the same age and we both read The Famous Five as little girls in the 1970s. We both have one brother and one sister, and both lived in Holland in the late 1990s, after traveling the world in our early twenties. Beyond that our lives diverged completely. I grew up in a stable, prosperous English-speaking country while she spent her childhood fleeing her native Somalia to spend years in Saudi Arabia, Ethiopia and Kenya. She began to cover herself as a teen to show her deeply-felt piety to Islam. She was sent around the globe for an arranged marriage to a man she hardly knew, and ended up a Dutch member of parliament. Ali is probably most famous in America for making the short film Submission with Dutch film maker Theo Van Gogh. Submission portrays four young women talking about their husbands’ abuses. The actress portraying all four has verses from the Koran written on her naked body which can be glimpsed through a see-through Muslim covering garment or chador. After the film was shown on Dutch television in 2004 Theo Van Gogh was murdered by a Dutch Muslim fanatic as revenge for what he saw as the film’s insults to Islam. This caused a fire storm in Holland and led to the dissolution of the Dutch parliament. Due to threats on her life, Ayaan Hirsi Ali was forced to go into hiding and eventually left Holland to move to America. Ali is a controversial figure who called the book Infidel because that is what she has become in some people’s eyes as she went from an obedient Muslim girl to outspoken defender of women’s rights and strong critic of practices like female genital mutilation. 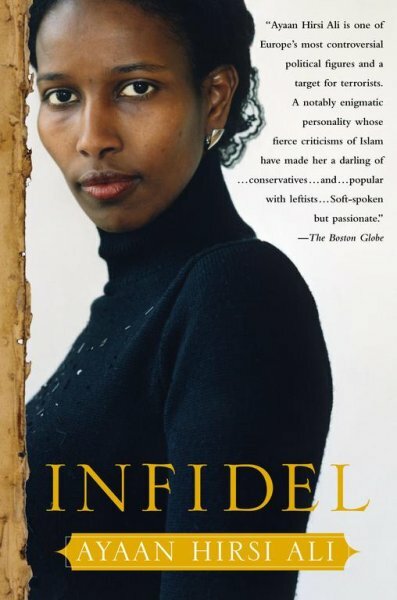 Whether you agree with her or not, Infidel is a heartfelt and moving portrait of an extraordinary life. Her life started in Mogadisu, which I think of as a war-torn hell-hole, but she knew as a beautiful city of stone and brick buildings and white sand beaches. She went on to live in several countries, squeezing more adventure into a few years, than most people fit into a lifetime. She now lives in the United States and has a husband and small child. Try Infidel if you enjoy biographies with the drama of novels, particularly those which cover true stories of women caught up in large historical events like Marie-Thérèse: Child of Terror, by Susan Nagel or Nella Last’s War, edited by Richard Broad and Suzie Fleming. I listened to Ayaan Hirsi Ali read her own story. Occasionally her accent made words hard to understand, but I strongly recommend the audiobook as a way to meet her. Check the WRL catalog for Infidel. Check the WRL catalog for Infidel as an audiobook on CD. This book breaks my heart. What child hasn’t felt shaken upon discovering that their faith in something that they had perceived as true and perfect is perceived by many as ridiculous and foolish? Hayat, at twelve, has that purity. He is sincerely trying to achieve faithfulness to Allah and to memorize the Qur’an on his own without formal training. At the same time, he is a very human boy, noticing his sexual awakening without being able to label it. The poor innocent is trapped in a hypocritical world with no trustworthy allies in his sight. 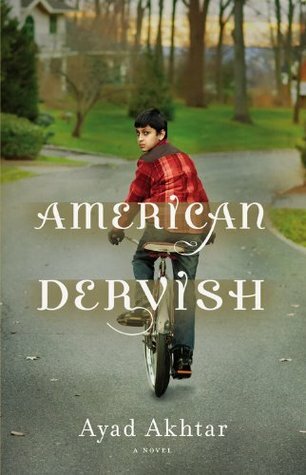 American Dervish is a coming-of-age novel that would make a good book-club choice because it easily triggers individuals to contemplate their personal journeys of spiritual faith as well as the cultural and societal pressures of growing up in America. Regardless of one’s religious or ethnic background, many grow up doing as they are told, imitating what is modeled for them. Eventually, if free enough to do so, listening to their hearts and figuring out what choices to make upon entering adulthood. Hayat is not alone in feeling alien among his parents and other authority figures. I loved this book and believe that it would appeal to many types of readers. Check the WRL catalog for American Dervish. The selection is supposed to be confidential, but it’s no time before second-rate reporter Alyssa Spiers gets her scoop on the front pages of the tabloid New York Post and all hell breaks loose. Suddenly the memorial is the sole property of the understandably angry families. Or a cause celebre for liberals rejecting knee-jerk hatred. Or the target of right-wing rabblerousers who proclaim it only lacking 72 virgins to make it a complete Islamic paradise for victorious terrorists. A chance for Muslim activists to reach a broader audience. A headache for the committee chair. A political liability. A personal and professional triumph for its creator, who demands recognition for his achievement without any need to defend his heritage or his design. Mo Khan considers himself a plain vanilla American—born to non-religious parents who immigrated from India, raised in Alexandria, Virginia, trained as an architect, promoted for his skill. No different from any other ambitious single-minded young man. Now he finds himself treated as a stranger in his own country, interrogated by the FBI on his first post-9/11 flight, his career derailed, and now his breakthrough achievement threatened. Mo now draws the line at sacrificing his vision, and the irresistible force of public opinion meets the immovable force of a proud man. 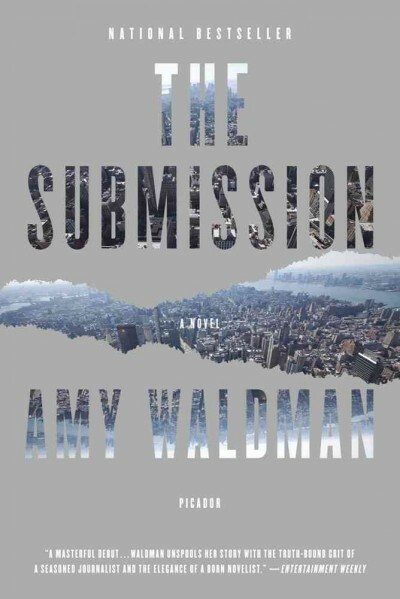 Amy Waldman does a terrific job exploring the needs and sensitivities of all the people with a personal stake in this controversy. Some are confused, unable to distinguish between their sorrow and their anger. Others are struggling with the balance between doing what is right and doing what is realistic. Still others cannot see a reason for the collective emotions, insisting on keeping the memory of their own loved one independent of the memorial’s politics. If the premise of The Submission sounds familiar, you may remember Maya Lin’s controversial design for the Vietnam Memorial in Washington. You may remember the hoo-hah over the Park51 project. (Waldman’s work on the book preceded that episode, and could even have been the blueprint for how it played out.) You may even know that the real memorial is not without controversy. As Waldman shows in a very effective epilogue, Americans tend not to hold grudges, even when our social progress is made in fits and starts. If only there was a way to speed up the process. The Submission is also available as a Gab Bag. Humor is hard to do. It probably ties with horror as the hardest type of story to develop and sustain through the end of the book. Thankfully, both God and amanuensis David Javerbaum, a veteran of The Daily Show, are able to pull it off. 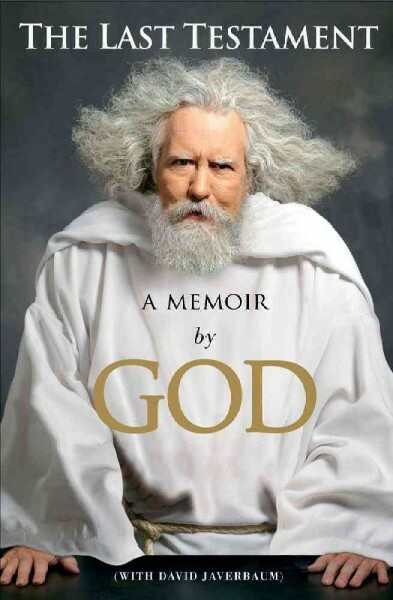 For one thing, God is aware (as one would expect from an omni-omni being) of his own sense of humor, although he occasionally suspects that it may border on the sociopathic. So now we have, from his own lips, the truth of the stories collected in the Book that has the highest sales in the history of the world, even though the royalties don’t quite match the revenues. We learn the truth about Creation – yes, it was Adam and Steve – the zing that’s going to greet new arrivals at the Golden Throne, and the greatest Broadway show of all time. And hey, God does have favorite sports figures, with drastic repercussions for The Second Coming. In the midst of this tell-all confession, God opens up about his relationship with his children. Yes, plural. Jesus is the middle child. His older brother Zach is nicknamed The Holy Ghost for his favorite trick, sneaking up his brother and yelling, “Boo!” His younger sister is Kathy, whose envy of Jesus’ sacrifice led her to beg her Father to allow her to do the same. (You’ll have to read the Book to find out how they accomplished it.) But Jesus is not only His favorite, he’s the only one who can overcome His Father with The Look. OK, so you’re not supposed to take it seriously. There’s no doubt about that, even though God takes pains to tell us on several occasions. The Last Testament is a parody that explores the gap between people’s interpretation of the Bible, and their actual knowledge of the Book, interpreted through the lens of a writer familiar with history, theology, exegesis, psychology, and current events. And if you decide to take it any other way, check out Againesis 19:4. With tongue firmly in cheek, David Javerbaum has delivered a funny book that succeeds in making the reader look at the world from a new angle. And that’s why humor is hard to do. In the flap over the Park51/Cordoba House building project, most Americans continue to assume that the Muslim world is a single entity, a monolith stretching from Israel to Indonesia with a single opinion given to them by Osama bin Laden. 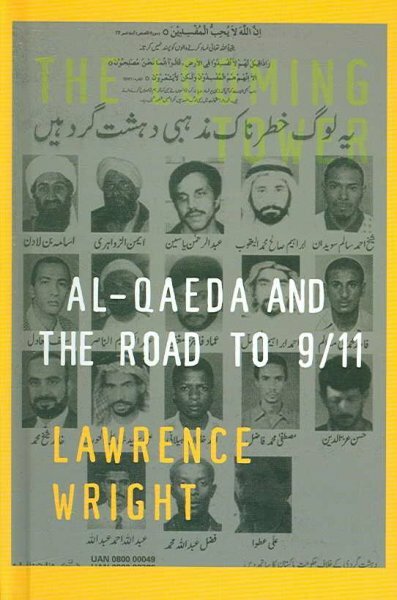 In his meticulous reconstruction of the history of al Qaeda, Lawrence Wright also manages to explore the deep fissures that divide Muslims, so that The Looming Tower ought to be the starting place for anyone who genuinely wants to understand why the Cordoba House project effectively has nothing to do with September 11. According to Wright, the attacks on the World Trade Center (including the 1993 truck bomb that killed six people) had their origins in the travels of Sayyid Qutb, an Egyptian scholar who critically observed U.S. culture and decided that it must be overcome by a militant Islamic revolution. But his initial target wasn’t the West—it was the secular and even corrupt governments of the Muslim world, which he thought must be brought down in order to achieve his ideal of a monolithic Islam. At the same time, Wright follows a parallel timeline as a handful of U.S. law enforcement and intelligence agents pick up al Qaeda’s trail. The most prominent of these, FBI agent John O’Neill,was unable to convince his peers and superiors that a threat existed, and so got only minimal resources to investigate al Qaeda even as the group began achieving their signature multiple attacks against what they saw as Western targets. Wright’s rigorous history takes on an air of urgency as the story approaches the infamous day. It is left to the reader to supply the foreshadowing: Wright doesn’t have to. Instead, he capably follows the theological and political goals of those few Islamists who have carried their hatred of the West to its violent extreme. But he also shows that the religion and culture of Islam can be so fractured and sometimes fratricidal that sensible people need to be informed before making pronouncements against 1.5 billion people. With any luck, books like The Looming Tower will have more impact on both policy and public understanding. Osama bin Laden was killed May 1 by a team of Navy SEALs and CIA operatives after an 8-month investigation that turned him up in a compound close to the Pakistani military academy and a major Pakistani military base. His presumed successor is Ayman al-Zawahiri, and as Lawrence Wright points out in The Looming Tower, al-Zawahiri may be both the philosophical and strategic mastermind behind al-Qaeda. If bin Laden was only a figurehead, his death may not have the impact on the movement that we hope.